Consumers continue to seek protein, but may not realize that the quality, not just the quantity, of protein consumed impacts its retention. 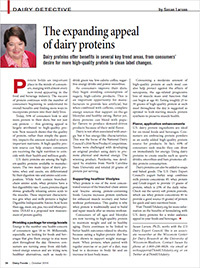 U.S. dairy proteins-whey and milk-are among the highest-quality proteins available to manufacturers and have a set of benefits that align with consumer needs. Dairy proteins not only blend well with a variety of products thanks to their mild taste and advanced functional properties, but they also assist in helping consumers manage their weight, age healthier, and when combined with caffeine, access a better-for-you energy source.